Forgotten Felines of Maine hasn't added a story. Freida is a very sick girl. Freida was found in a ditch in April 2013, hours from death. Her liver had shut down and at 9 months old she weighed just 1.8 lbs. She spent a year struggling to live and her health has always remained fragile. Since September 21st we have been to Tufts University 3 times and Freida has undergone bloodwork, X-rays, ultrasounds, needle aspirations and more...with vet bills at almost $4,000 Freida still has no diagnosis as her case is so complicated. Freida could have cancer (as first thought), life threatening bacteria or even FIP. Whatever it is there is progression with each blood test so we need to continue to try to find a diagnosis. Only then can we help her. I spoke to Freida's internist from Tuft's Universary's Fosters Hospital for Small Animals yesterday. We reviewed Freida's bloodwork taken last week and while her anemia is now a bit better, her blood protein albumin lowers with each blood test. This is VERY worrisome and means that something is SERIOUSLY not right. On Thursday Freida must go back to her local doctor for another blood panel to test for Bartonella. Many bacterias were ruled out with last weeks bloodwork. Because of Freida's small size her specialist worries and wants to give Freida a break between all the stresses of all the testing. Her hope is with the bloodwork done locally she can rule out some things. While cancer, bacteria and FIP are still options...we need to move forward with yet another ultrasound. The next step however will be an ultrasound with ultrasound guided biopsies. This will require Freida to spend an overnight at the hospital. The specialist said anesthesia is much better today and she is not too worried about the anesthesia. She will call next week to schedule the ultrasound. Meanwhile Freida is to remain on all the meds she is on. She said that because of the lowering albumin it is critical that Freida doesn't get diarrhea so she will remain on Metronidazole as well as her anti nausea medicines and her appetite stimulant. Freida needs to continue to eat to keep up her strength. Freida needs lots of prayers and continued well wishes. We will continue to share her daily life with you..her ups and downs and just her every day life. If you love Freida and follow her and she makes you smile please help us with her medical bills. Write "Freida" on the memo line of the check. please write "Freida-Forgotten Felines of Maine" on the memo line of the check. We will continue to share our beloved Freida with you all...she belongs to all of you. We are sorry to have so many of you filled with worry. Please know we love Freida and will do everything we can for her always keeping her happiness first and foremost in our minds. Forgotten Felines of Maine hasn't posted any updates yet. 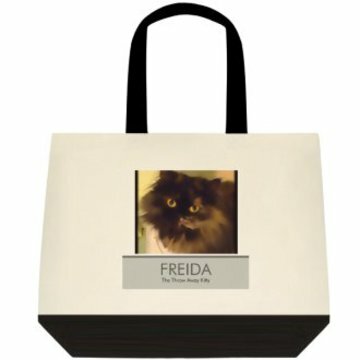 Canvas tote size 19"x15"x6" with photo of Freida. Great tote and our gift to you for $100 or more. 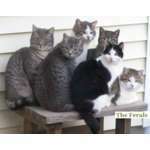 Forgotten Felines of Maine is managing the funds for this campaign.